911uk.com - Porsche Forum : View topic - A few notes from a very smug 911 owner. 911uk.com Forum Index > 997 (2004 - 2012) > A few notes from a very smug 911 owner. Posted: Sat Jun 18, 2016 11:25 am Post subject: A few notes from a very smug 911 owner. There's been a lot of chat recently about the way values of 997 Turbos have gone up in the last year so I thought it timely to stick up a post about my 16 months of ownership - especially as I've just clocked up my 8,000th mile in that time. My saddo's spreadsheet tells me that the total cost of buying my car, keeping the OPC history up to date and putting an OPC warranty on it until March 2018 has cost me a grand total of £47,803. That cost doesn't include the £1147 I've spent on cosmetic improvements (detailing, wheel refurb etc) so if I add that on the car stands me at £48,950. I know that mine is a hugely undesirable Tiptronic, is finished in 'marmite' Guards Red and has now done a massive 56,357 miles but even so, looking at recent adverts, I reckon that a 2007 car with full OPC history and 21 months OPC warranty would probably cost me that same £48,950 if I was to buy it today. My smugness comes from the fact that I've owned my car for 16 months, done 8k miles in her - including 3 fantastic eurohoons - and increased my personal top speed achieved to 177 mph (with the car still pulling strongly) but could probably get £42k back if I was to do a sale-or-return deal. 16 months ownership of an iconic car for under £7k. What hire car can you get for £15 a day? Obviously my car hasn't been as good an investment as if I'd bought a 993, a 996 GT3 or even as good as if I'd kept my 996T but I didn't buy it as an investment. I bought it as the newest, best value-for-money and totally usable 911 I could find at that time. Tax, insurance and fuel (21.8 mpg) haven't cost any more than they would have done for a 'cooking' 911 so you could say I'm a really happy chappy. Here's to a great summer and another cheap 3,000 miles of fun before SORN. A nice write up and good use of the car too - thats why we own them! Porsche ownership can also make financial sense - if you pick the right car at the right time. I know that I've hardly lost anything on depreciation in the last 12 months. Had I been in a new £35k Merc or BMW, I know that the car would be worth around 30% less. But the fact that I get a smile on my face when I drive my 911, and soon too will be doing a trip to Euro land - makes it even more worthwhile. Great to hear your story! Got me thinking about mine... I think I paid £24k for my 996 turbo with 42k on the clock. Its now just ticked over 75k miles. I reckon i've spent about £10k on tuning, paint and mods. I believe I could easily sell it for at least £40k if I wanted, without too much of a wait given the condition its in. Interesting post. I think these cars are quite inexpensive to keep as far as needing parts. Apart from the things I have opted to do to my car, it has been very few repairs and parts. I don't want to think what I have spent on my car right now. I suspect it's about a gen.2 997 price! A bit of man maths involved, but low overall cost was one of the main justifications for buying my 993 a couple of years ago. Posted: Sat Oct 29, 2016 4:57 pm Post subject: Re: A few notes from a very smug 911 owner. Today I did the last of those 3,000 miles (which included a 4th Eurohoon) and the only cost I've incurred beyond insurance, tax and petrol was the £285 I had to shell out yesterday for having a split driveshaft gaiter repaired. To celebrate I'm not going to SORN her until the end of November. Great post - they are fantastic cars! Nice one Terry.Your car is stunning. Posted: Fri May 19, 2017 1:34 pm Post subject: Re: A few notes from a very smug 911 owner. Update at 13,000 miles / 27 months of ownership. My saddo's spreadsheet tells me that the total cost of buying my car, keeping the OPC history up to date and putting an OPC warranty on it until March 2018 has now cost me a grand total of £48,469. That cost doesn't include the £1147 I spent on cosmetic improvements (detailing, wheel refurb etc) when I first bought the car so if I add that on the car stands me at a grand total of £49,616. The car is still the hugely undesirable (or should that read underestimated) Tiptronic, is finished in 'marmite' Guards Red and has now done a massive 61,403 miles. On top of that values do seem to have fallen a little in the last 6 months but even so I reckon that a 2007 car with full OPC history and 9 months OPC warranty would probably cost me £48k if I was to buy it today. My continued smugness comes from the fact that I've actually owned my car for 27 months, done 13k miles in her - including 5 fantastic eurohoons and could probably still get £42k back if I was to do a sale-or-return deal. 27 months ownership of an iconic car for £7.5k. That's less than £10 a day. On top of that there's obviously tax, insurance and fuel (22.1 mpg) but even these haven't cost me any more than they would have done for a 'cooking' 911. Fingers-crossed I shouldn't have to pay out for anything other than petrol and oil this summer although by then it will definitely need rear tyres. 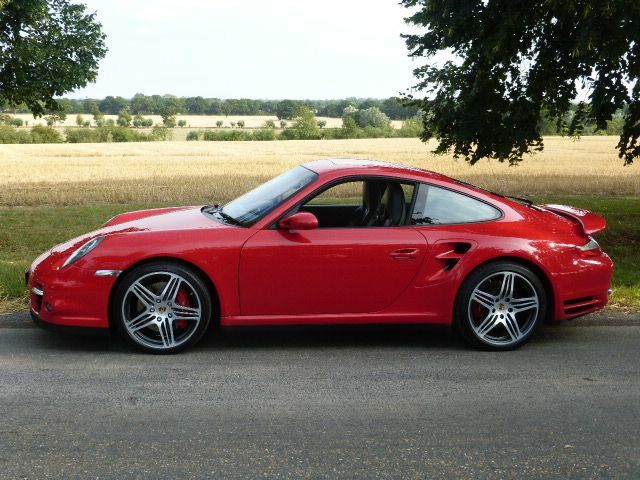 Who knew that running a 911 Turbo could be such cheap motoring. Hi T8, your experience is very similar to mine. I bought my 997 Turbo S, 12 months ago from Joe Shaw in Manchester and barring a few jobs that needed seeing to, has been a superb car to own. I've only done 3000 miles in mine since I bought it and most of those have been on runs out with other 911uk guys and PCGB as well. Was going to do a speel about what I've done to mine but didn't want to hijack your thread! T8, great to see someone that truly enjoys the whole ownership experience so much and still gives it a European run or two per year increasing financials are great, driving it is priceless.. I'm similar, although wish I had not sold my 993 Turbo, or to matter my 964 Turbo. I've had it longer though and due to around 10k of mods and some common things giving up I've spent more. Still love it though, and its a much hated black on black manual ! Good cars these ticks nearly every box, even the "its all to easy to drive fast" box, and I think its one of the best looking 911's, though it very nearly went for a F430 a month back. Need to use mine more, as I'm loving the M3, so I have drove it once this year !! I am going to try and make this big beaulieu meet with it. You Can't beat it, hears to winning again at lemans I shall be there to enjoy it with my son for bottles of leffe and food and spectical. Looks really great in Guards red. I really like the bright colours. I missed out on a Speed Yellow car when I was looking which I'm still gutted about. I eventually bought a manual Atlas Grey Turbo in August 2014 with 28k miles for £41k. It now has 34k and despite the usual consumables, has been reasonably trouble free. I've added a Kline exhaust, TPC racing DSC module and a few other bits and bobs, but even now nearly 3yrs later I don't think it would owe me much if I decided to sell it. Not sure what I'd swap it for though, so I think it'll be staying with me for a while longer. Really are great cars.